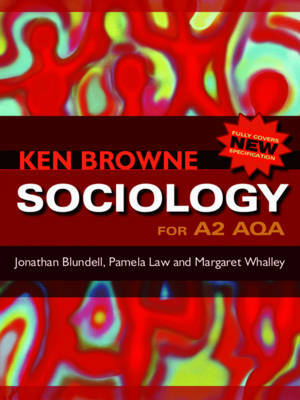 This new textbook has been designed to accompany Ken Browne's widely-used Sociology for AS AQA . Ken Browne has teamed up with co-authors Jonathan Blundell, Pamela Law and Margaret Whalley who have a wealth of classroom experience and all share a passion for teaching sociology. In this book they combine sociological rigour and accessibility for final-year A-level students. This exciting, full-colour textbook includes: chapters on each topic covered in the A2 specification; special sections on research methods in the chapter on crime and deviance, and stratification and differentiation; up-to-date discussions of a wide range of recent sociological data and debates; lots of colour photographs and diagrams to bring ideas to life and fire students' imaginations; a dedicated website, including resources for teachers and additional material designed to help students revise or research themes in the book. Key sociological terms are systematically highlighted throughout the text and are included in a comprehensive glossary, with thoughtful questions and activities at important points within the chapters to develop and test students' understanding further. Exam style questions are also found in every chapter. Pitched at exactly the right level for the new AQA A2 sociology specification, the book provides all the tools necessary to help students achieve top grades and encourage them to take their study of sociology further, whatever their needs, interests and abilities.